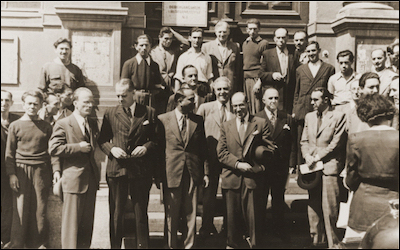 Members of the United Nations Special Commission on Palestine, Vienna, 1947. Seventy years ago today, the United Nations Special Committee on Palestine (UNSCOP) introduced a detailed proposal to the UN General Assembly for the partition of Palestine into a Jewish and an Arab state, approved less than three months later by a vote of 33 to 13. Not for the last time, however, a concerted international effort to resolve the Israeli-Palestinian conflict foundered on the shoals of Arab rejectionism. Arab Muslims roundly condemned UN partition — and more broadly the very principle of a Jewish state anywhere in Palestine — striving instead for complete victory. Following the tribally-based principle of those closer uniting against those more distant, the opposition to the Jews was both organizational and religious. Jews were not kinsmen and, worse, were infidels. The Arabs acted according to their tradition, refusing compromise with inferiors. For over a millennium, Islamic empires had spread by the sword from Arabia across the Middle East and North Africa to much of Europe and as far east as India. God bestowed upon Muslims a right — no, a duty — to dominate Dar al-Islam (the house of Islam) forevermore. Not only did Jews, long a subservient and despised minority in Dar al-Islam, lack the right to have an independent state in Palestine, but the Arab residents of Palestine had no right to concede it to them. 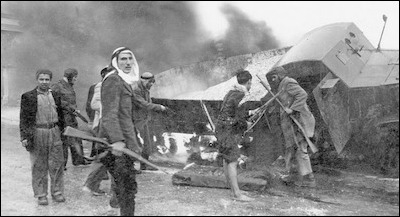 A truck ambushed by Arab irregulars on the main road to Jerusalem, 1948. The Arabs in Palestine thought that the Jews could not and would not stand up to them, and they acted on that well-established cultural principle. However, the thousand-year-old conditions did not obtain this time around. The Jews they faced were not a dhimma, and they did not cower. Against the odds, and with little outside help, they fought and won. Again and again. While maintaining their uncompromising rejection of any Jewish state in the Holy Land, the Arabs eventually abandoned their triumphalist rhetoric in favor of a more useful narrative. In this retelling, Israel is responsible for seven decades of mayhem, not the victim of unremitting hostility. That role would now be played by the Arab residents of Palestine, now called "Palestinians" — indeed, they would be forced to play it by the refusal of Arab states to naturalize, or even provide humane accommodations, to the so-called "refugees." The Arabs abandoned their triumphalist rhetoric for a more useful victimization narrative. This narrative has received a particularly warm reception in the academic world, where Western imperialism, rationalized by disparaging "Orientalist" stereotypes of Middle Easterners, is seen as the single greatest cause of the region's ills. Of course, blaming all Palestinian problems on Israel makes even less sense than attributing the Arab-Islamic world's economic, political, and cultural decline in recent centuries to relatively brief and limited Western interventions. The Arab victimization narrative hurts Palestinians by obscuring the actual sources of their misery. Though the narrative has grown more and more fantastical over the years, its acceptance remains disturbingly widespread. Palestinian Authority President Mahmoud Abbas' condemnation of Israel for "destroying the environment" at a signing ceremony for the Paris climate accord last year encountered no howls of diplomatic protest. Dubravka Simonovic, the UN special rapporteur on violence against women, could claim weeks later that Palestinian men beat their women because of "the clear linkage between the prolonged occupation and violence against women" without being promptly terminated.